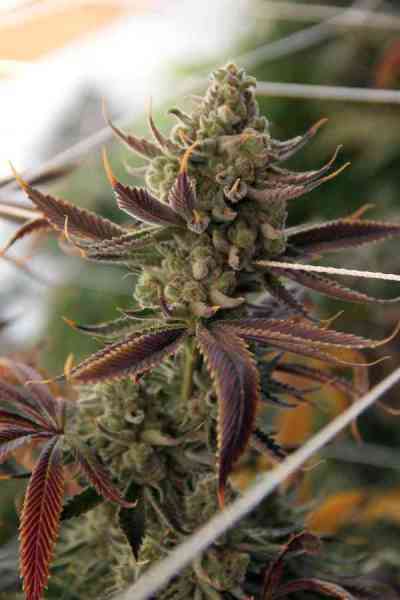 Conspiracy Kush is a hybrid that is an excellent choice for growers who are looking for an indica dominant plant. Most all phenotypes will have a middle of the road growth structure when it comes to height. When it comes to bud structure, you will be impressed to say the least. This strain contains heavy, dense, frosty white flowers, backed with tons of color variations, containing deep purples to light pinks, making great bag appeal. The high on this medicine is a very strong euphoric head high that comes on fast and will hang around for a few hours, becoming more mellow as time goes on. It's a high that is great before bed or for clearing the mind. Lastly, flavors and aromas vary depending on the phenotype, but all will have a fruity, almost citrus funk, grabbing characteristics from all parents around the board. Phenotypes: there are five main phenotypes. All have very different smells ranging from fruit smoothie to a lemon musk with a hint of funk. The main difference between phenotypes is the variations of colors ranging from violets to dark purples with a heavily frosted bud structure that can have pink undertones. Best way to grow: Top once. Get plant to almost the desired height because it typically does not have a large stretch. High Type: Stoney, euphoric head high that you can feel creeping in your face within minutes. Great night time smoke for relaxing and getting you ready for bed. For the everyday kush smoker that likes to get high this one is for you. Taste/Aroma: Phenotypes range vastly in taste, grabbing characteristics from all parent plants combined. Hidden within, you will find that a fruity funk will be dominate, but in that fruit mix you will also discover a lemony musk, cherry drops, with an under tone of an OG funk. The taste is a heavy fruit salad with an earthy popery exhale.